Discussion in 'Transformers On Ebay' started by neuroticaa, Aug 18, 2010. Hi there, Ill just want to ask if it exist a ko us computron giftset ?? And if it exist, how to identify it?? A Computron Giftset KO does exist. Well, its easy to spot because it says Living Metal robot or something like that on the package. Well, its easy to spot because it say Living Metal robot or something like that on the package. Ha! Those crazy-spelling KO toy makers. 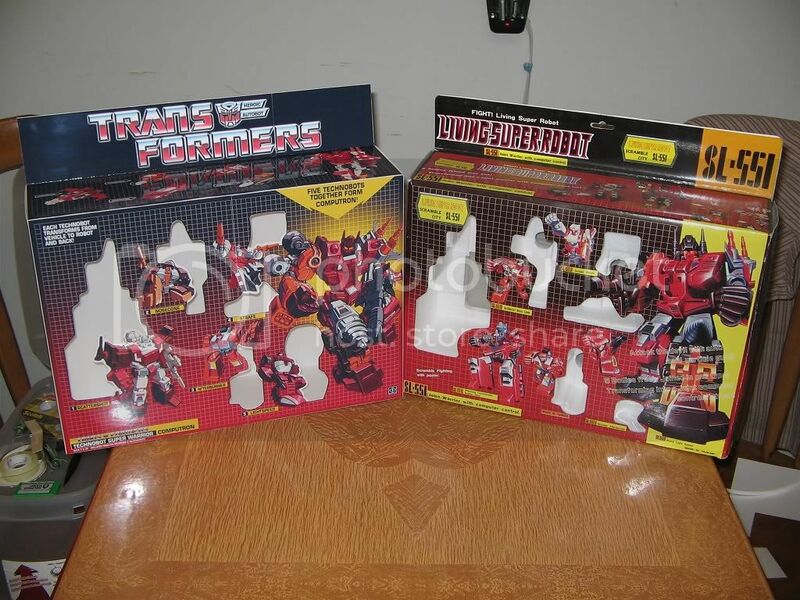 Are you asking about one with packaging that replicates the G1 packaging exactly or closely? In which case, i don't think they're generally known to exist, but they could quite easily be around. Ok but if it exist? Do you know how to spot the differences, or do you know anyone that knows? The KO gift set box look like the one on the right in my pic here.. The box on the left is the one i made for a friend.. The KO box is very easy to spot. Actually there us a ko Japanese giftset box that is difficult to spot, I got burned on one. It is an exact copy with poorer resolution images and a strange coating on the cardboard. Unfortunately is was very difficult to spot in pics, but there is no styro for them which might help spot them yo warrant further scrutiny. Yes, wasn't I the one who warned you about it when you brought it in 2007? computron always reminded me of the weirdest G-1 combiner in the USA. as it really had no set theme. it was basically a bunch of random vechicles thrown in the mix that combined into a gestalt. other G-1 USA combiners had a set vechicle theme in the teams. like the stuniticons were race cars. the aerialbots were all jets. devestator was all construction vechicles. bruticus were all army vechicles. protectobots were all rescue vechicles. predacons were jungle animals. terrorcons were all animals. seacons were all sea creatures. the technobots had no unified theme among the team members. a jet,a even bigger space jet,a motorcycle,drill & race car. about the only thing that unified the team was the matching color schemes. The 'theme' was futuristic vehicles... which admittedly had permeated much of the line anyway. As for some of the other gestalts, it's somewhat debatable. You had a passenger aircraft mixed in with military aircraft, a space shuttle mixed in with armored combat vehicles, and a collection of animals some of whom weren't necessarily predatory.